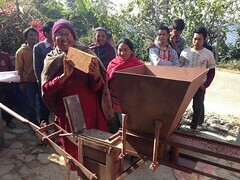 These bright and beautiful faces have experienced the extreme hardships of rural, conflict-ridden Nepal. They have lost one or both parents and are from poor families where no one else has the means to take care of them. They were not receiving an education nor sufficient food. The difference now in their lives and smiles is profound! Sancha Maya Tamang After her father died, Sancha Maya’s mother abandoned her to marry another man, leaving her with an old grandmother. At our home, Sancha Maya has been learning to speak Nepali (instead of only her native Tamang) and has a mischievous grin! She loves to help cook and clean up. Sanjay Giri: Sanjay’s father went missing and is believed to be dead. Sanjay’s mother abandoned him so she could marry another man. His current stepfather drinks alcohol and beat him regularly. 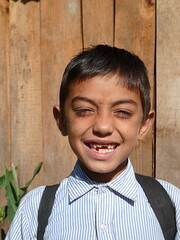 Sanjay would run away and go walking throughout his village area to find food and a place to sleep. Villagers liked him, so they suggested that we give him a permanent home. When he first came, he was fighting with other children all the time and using bad language. After only 6 months, he calmed down and likes to snuggle. When his stepfather came to take him home for a visit recently, Sanjay refused to go. He’s happy staying with his new family–and he still has a strong independent streak! 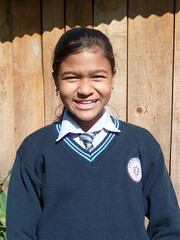 Rubi Bhandari was abandoned by her parents. She was sent to school about a year ago, but her parents never came back to claim her and have been missing/out of contact ever since. The school put her out on the street when her fees weren’t paid. Her grandmother heard about it and came to find her, but is too old and poor to care for her–so Rubi came to stay with us. Gunga and Jamuna Gharti are twins, named after sacred rivers. Their mother died 11 days after giving birth, and their father abandoned them. While children are generally the responsibility of the father and father’s family, his family would not take them in. Their maternal grandmother took them in when they were little. Old and poor, she could no longer care properly for the children, nor send them to school—which is how they came to us. Pasang Dorje Lama has a father living in Malaysia who sends no support. His mother disappeared, and his brother faked documents to go to Malaysia and work at age 15. 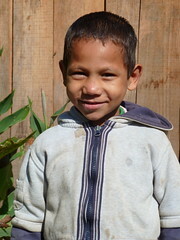 An aunt too poor to take Pasang into her house placed him in a orphanage. Both he and Krishna were found in this orphanage that had terrible and abusive conditions. The orphanage has since been closed, and both boys came to stay with us. 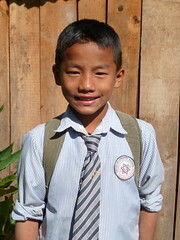 Pasang has good English and is a bright, curious and outgoing boy. 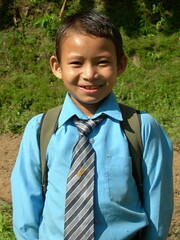 Krishna Tamang was found walking alone on a road when he was young. The police returned him to his village and found that his mother was dead and his father had disappeared, so they put him in an orphanage. Both he and Pasang were found in this orphanage that had terrible and abusive conditions. The orphanage has since been closed, and both boys came to stay with us. For a long while, Krishna was quiet and reserved, but you can see how much his sense of security and confidence has improved over time with his new family. He now has an easy smile and doesn’t resist affection. Sukumaya Tamang was only a month old when her mother died. Her father died a few months later, and she was staying with an old grandmother too poor to care for her. 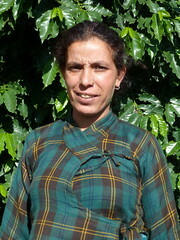 She was not attending school regularly and was working in the fields. Her family has a history of dissociative illness, and Suku is also troubled by this when stressed. In a country with little mental health support, we provide a calm and stable environment where she can thrive. 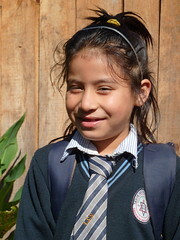 She enjoys studying and school and wants to learn to sew. 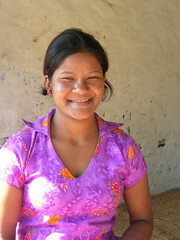 Sanju Bishwakarma was living with her mother after her father died, but her mother could not support all 4 children. Her 15-year-old sister left to work in Kathmandu, another sister has disappeared, and one sister remains with their mother. Sanju is excited when we bring new books, and her English has improved significantly. Sushil & Pradip “Saroj” Karki‘s father disappeared more than 6 years ago. One day their mother left for the local bazaar and never returned. Locals found the brothers walking alone on the streets and asked the police for help. 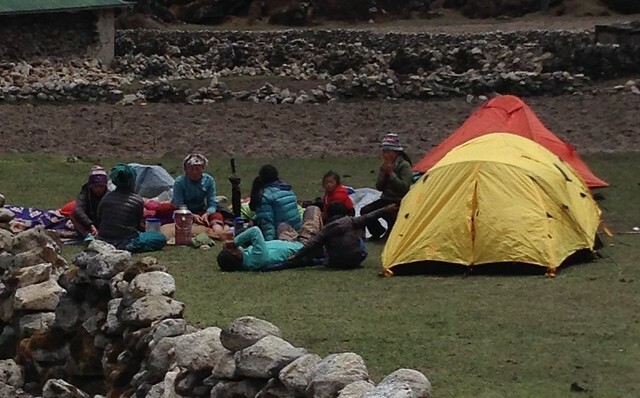 After searching fruitlessly for the parents, police requested our orphanage to accept them. Their grandfather, too old and poor to care for them, has offered his house when they are older and have completed high school. Kabita Thapa‘s husband had a kidney transplant 5 years agon and then passed away suddenly last year. Alone, and somewhat ostracized since her husband had taken a second wife, she struggled to provide for and educate her two children. 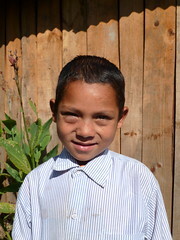 Her younger daughter stays with her sister, and her son Bikram lives with her at the home and we are sending him to school. Goma Acharya and her little son Saurad are the newest addition to our home. Goma is a loving young mother much appreciated by the children. More information on her after our next visit. 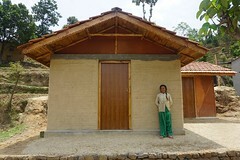 Laxmi Shahi (24) was stranded in her mother-in-law’s house in a water and food shortage area. She had no means of supporting herself, no husband (because he’s been living in India and providing no support), and no respect (because she is childless). From this difficult situation, we hired her and placed her in a house full of children. She nutured the children, treating them all fairly, even those of lower caste. She also earned a steady income of her own. After three years with us, she was markedly more confident and self-assured. She has decided to pursue a beauty school education and wants to open her own ladies salon! We were all sad to see her go, but it’s great that she has found the confidence to pursue her own dreams!